ST. GEORGE — A vehicle theft and short foot pursuit sent one St. George man to jail facing more than 10 felony charges along with a cluster of misdemeanor offenses while the man’s accomplice was admitted into the hospital from injuries he sustained while fleeing police. Dustin Wayne Adair, 24, was booked into Purgatory Correctional Facility Tuesday on three felony statewide warrants after he and an accomplice allegedly jumped out of a stolen vehicle and ran from police. Adair, who appeared in the 5th District Court in St. George Thursday, was arraigned on 24 charges, including 11 felony and 13 misdemeanor offenses. He is charged with one count of second-degree felony theft; two counts of drug possession schedule 1,2 analog, two counts of theft, five counts of acquiring a finance card without consent; two counts of possession of another’s identification without consent and one count of theft by receiving, all third-degree felony offenses. He also is charged with eight counts of vehicle burglary and possession of another’s identifying documents, which are class A misdemeanors, along with four class B misdemeanor offenses, which include two counts of criminal mischief, one count for interference with arresting officer and one count of possession of paraphernalia, according to two probable cause statements filed in support of his arrest. 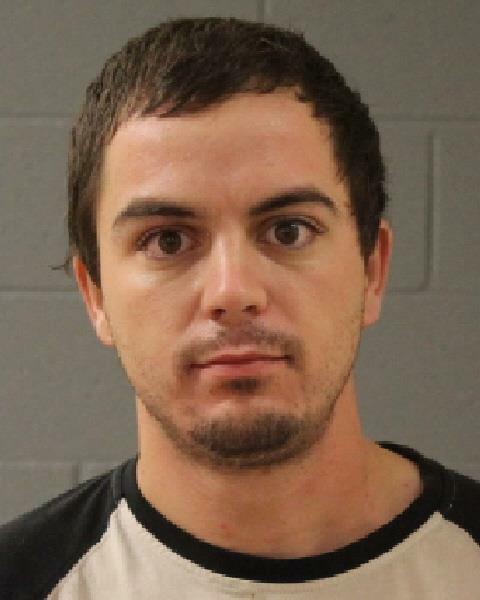 The charges stem from a July 31 incident involving a pickup truck stolen from an area a few miles south of the St. George Regional Airport. A detective leaving for work shortly after 6 a.m. spotted the vehicle near 100 North Valley View Drive after reading the alert sent out to patrol. The detective followed the pickup in an unmarked vehicle. Reinforcements arrived and detained the two men after a short foot pursuit. One man was transported to Dixie Regional Medical Center where he was admitted for ankle injuries and has not been charged with any crime as this report publishes. During a search of the stolen truck, officers found five credit cards, seven gift cards and two pieces of identification that did not belong to Adair. Police say he admitted that he remembered breaking into five unlocked vehicles to steal property after an Uber driver dropped him off at a housing complex just off of Southern Parkway at 1 a.m.
Police allege that Adair also admitted to stealing items out of several other unlocked vehicles and discarded much of the property in various trash cans throughout the area. Once he came upon the unlocked pickup truck that officers later found him running from, Adair told police he found the keys inside of the truck and then drove around for hours. Adair allegedly told police he “sprayed vinegar inside of the stolen vehicle in an effort to destroy any possible DNA evidence,” the statement said. The suspect and his accomplice then noticed the unmarked car later that morning and ran from the truck before being detained by police minutes later. In November, Adair was charged with five counts of unlawful acquisition of financial card without consent, as well as misdemeanor charges for possession of identification of another without consent, along with felony drug charges in August that resulted in two warrants being issued for his arrest. In 2013, Adair was convicted of third-degree felony robbery stemming from an incident where he and three accomplices were apprehended after snatching a purse from an elderly woman in the Washington City WalMart parking lot. Adair’s next court appearance is scheduled for Monday, Aug. 6 at 2:30 p.m. Okay, toward the end of the article read carefully the crimes he’s already been arrested for in the not too distant past. Whatever punishment, if any, that was bestowed upon him did apparently no good because just look at what he’s behind bars for this time…!!! I have ZERO confidence that the legal system in Washington County will do enough this time either to deter this criminal from being right back at his chosen “profession” in the near future! What the hell does it take to protect ourselves and our property from repeat offenders in this county who seemingly get a slap on the wrist over and over? I agree, it seems like people who commit serious crimes get a “slap on the wrist”, so to speak, then are promptly released back into the community and this is the result. It’s a good thing I don’t make the laws in this country, because if I did, serious crimes would have consequences so severe, it would make people think twice before doing something stupid. For example, if I could set the punishment for stealing a vehicle, the perpetrator would be tied to the back of a truck with rope, and would be slowly dragged along the ground in a public area for all to watch. Not enough to kill them, but enough to make them suffer, and make those who watched see exactly why it’s NOT acceptable to even attempt to steal something! you should move on over to saudi arabia. so when you leaving ? When are you leaving mommy’s basement? Sounds like you might be a member of Anti-fa; you know the Nazi black shirts running around the country (big in Portland) and starting violence. Nope, just a member of anti-stupid. Some people were built for prison. This guy could have any number of jobs to keep out of trouble, but he enjoys the thrill too much. Prepare for a longer time out. Yes, Redbud, that would be a fair punishment. I’m tired of all these smucks thinking they’re above the law. Who are the other perps, I’d like to see their faces too.